Goaltenders are a superstitious bunch. Carter Hart, Team Canada’s No. 1 goalie at the World Juniors, is no exception. The Sherwood Park, Alberta native has a superstition of coming off the ice last – for both teams – at the end of every period. Against Finland, we saw him wait at the door for the last of his opponents to step onto the bench before he headed to the dressing room. Some wondered, what would happen if the other team kept their backup goalie on the ice for the duration of the intermission? Well, Canada’s opponent in the quarter-final on Tuesday put that theory to the test. With Zambonis circling, Switzerland’s backup Matteo Ritz hung out on the ice and so did Hart. The Swiss were clearly trying to mess with Hart’s superstition. TSN went to commercial after the period ended, and when they came back, Hart and Ritz were still there. “That’s the most ridiculous thing I’ve ever seen,” said host James Duthie. 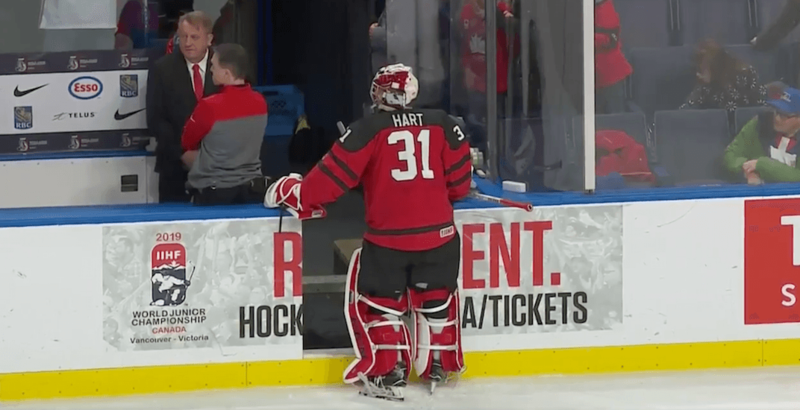 🇨🇦@HC_WJC 🇨🇦 goaltender and #LetsGoFlyers prospect Carter Hart got into an intense intermission standoff with the🇨🇭@SwissIceHockey 🇨🇭backup ‘tendy. Hart, a 19-year-old Philadelphia Flyers prospect, appeared to give up first. Once he left the ice, Ritz left too. But the Canadian netminder returned seconds later for a quick twirl, thus keeping his superstition intact.